Image taken on Feb.5th from Roberts Creek, with a 120mm Megrez and a DSLR camera. Sky conditions were q good with an SQM of 20 but humidity was high at >75%. Finally the clouds were gone and we were able to view the comet 46P Wirtanen last night. Club members viewed it from the observatory and I took the opportunity to photograph it from home. 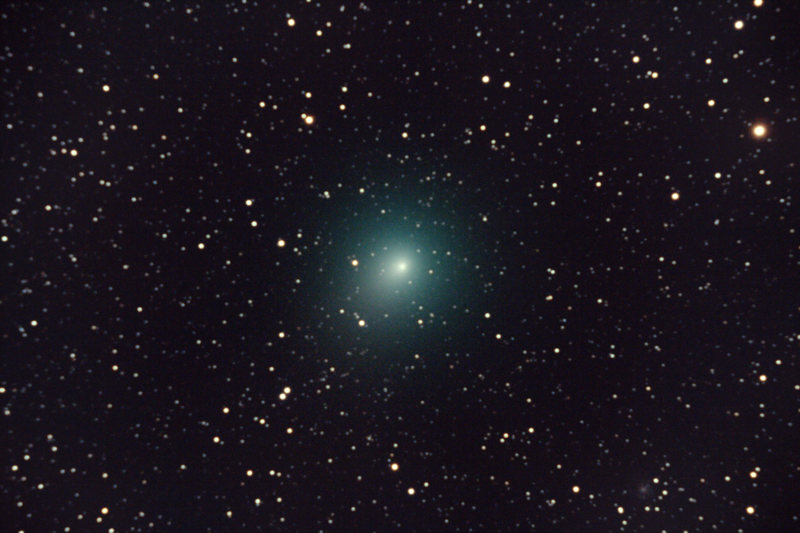 46P/Wirtanen is a small short-period comet with a current orbital period of 5.4 years. It is currently about 12 million kms from earth. I wasn’t able to see the comet by eye but was easy to see in binoculars or the scope of course. 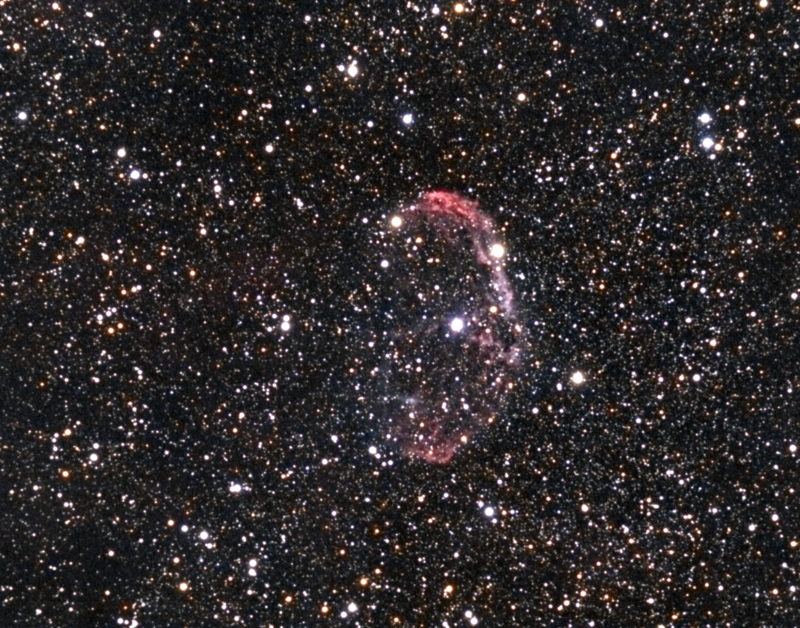 The Crescent Nebula (NGC 6888) is a cosmic bubble about 25 light-years across in the constellation Cygnus, blown by winds from its central, bright, massive star. 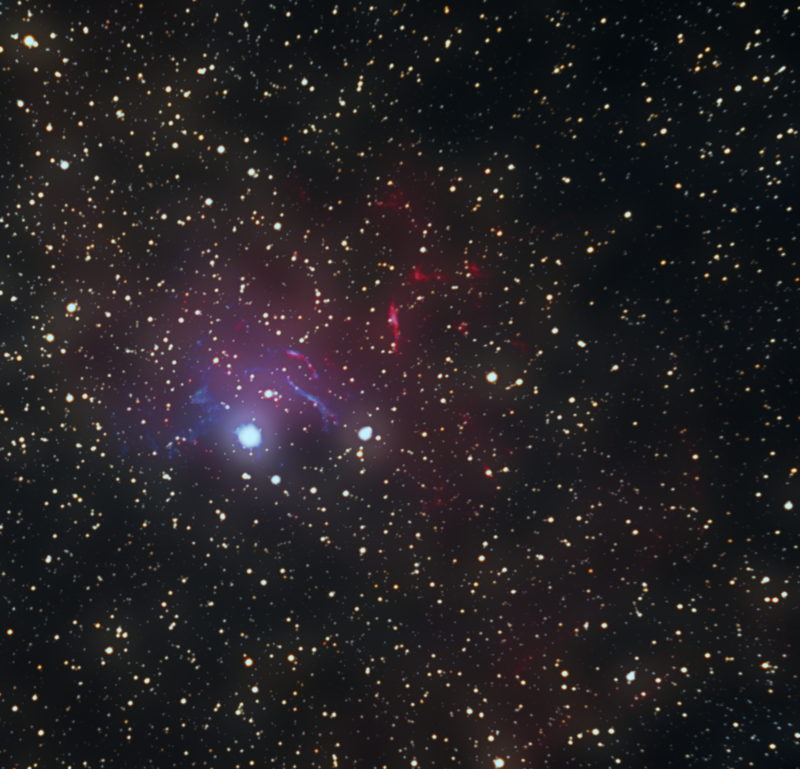 The nebula’s central star is classified as a Wolf-Rayet star (WR 136). The star is shedding its outer envelope in a strong stellar wind, ejecting the equivalent of the Sun’s mass every 10,000 years. The nebula is 5000 light years from us. Due to a shortage of instructors we have had to cancel the public night at the SCAC Observatory for October 13th. who will be talking about the new CHIME telescope. Our sun is still an interesting place to view! I took this image through the clubs new Quark Hydrogen Alpha (Ha) eyepiece last Friday mid afternoon (14/7/18), seeing was quite good. 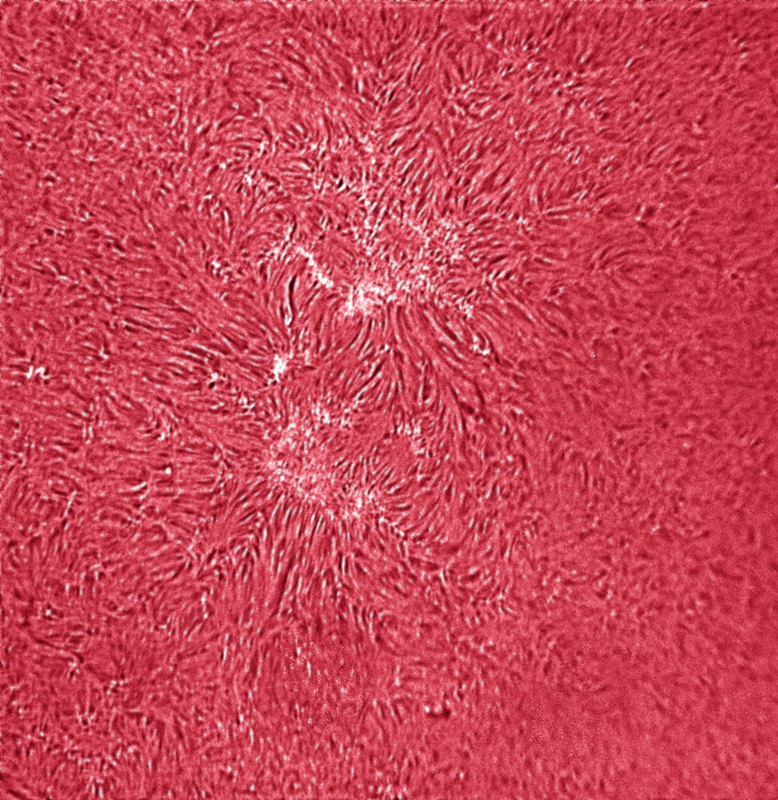 The combination of camera/eyepiece/telescope results in a small field of view, but one where the details of the solar chromosphere are revealed very nicely. The image was taken in monochrome and coloured to match the Ha colour..We are looking at an area where bundles of magnetic fields lines are concentrated. 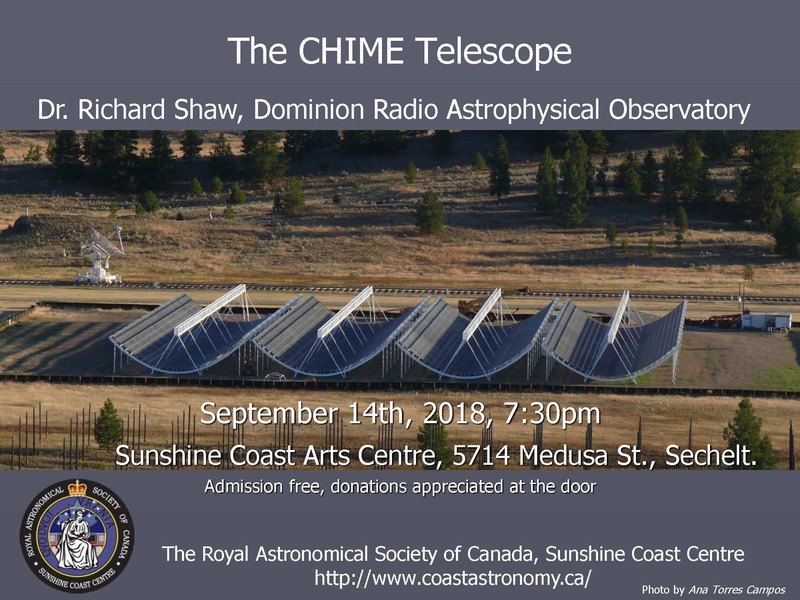 We will have the eyepiece, and other solar viewing equipment in use at the Gibsons Art Gallery next Saturday for our meet and greet with Erwin. Come by and take a look at his images and the sun!